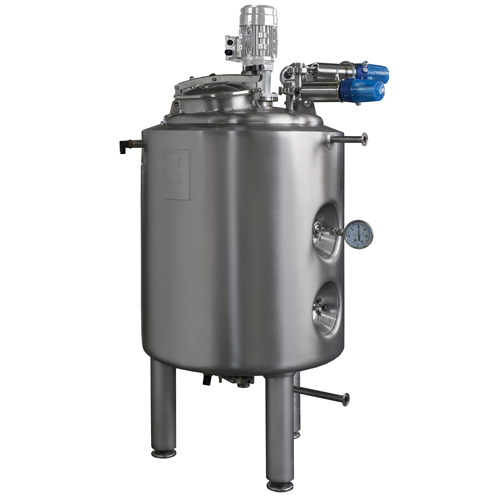 The Maturing / Fermenting Unit is a tank which allows milk to be heated and also cooled, with the aim in mind to pasteurize (heat) the product and control its fermentation (cool). 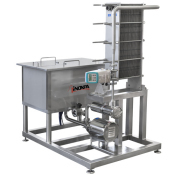 The unit can be used to produce yoghurts of different types, fermented milks and sour cream. Additionally this very same equipment forms an integral part of the process to produce butter. Production of yoghurt: after exiting the pasteurizer the milk is fed into the Maturing/Fermenting Unit. This heat treatment eliminates principally all the pathogenic flora. The contents are then cooled and the ferments or ‘starters’ are added. 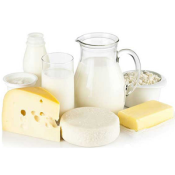 To make liquid yoghurt incubation is carried out in the Maturing unit with mixing and temperature control until the process of fermentation has finished. It is then cooled and packaged. 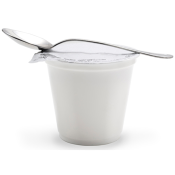 To make firm-type yoghurt packaging is carried out before incubation. It is then placed in a heated store-room for maturing and then cooled afterwards in a refrigerated store-room. Butter making: the elaboration of butter starts with the cream obtained from the process of skimming or standardisation of the milk. The cream is cooled and stored in the Fermenting Unit in a similar way to that of yoghurt. Vertical closed unit in stainless steel AISI 316L o AISI 304. Double jacket for heating with water or steam. 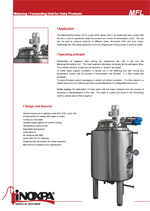 Variable speed agitator for uniform mixing. Spray balls for CiP cleaning. Peephole with illumination for visual inspection. Man-hole for inspection and maintenance. Filters for sterilization with steam.